Kent School is located in one of the most beautiful parts of the world. While the campus is surrounded by 1200 acres of pristine woodlands, including a section of the Appalachian Trail, the core campus is a tightly-knit enclave of lovely Georgian brick buildings which make up the heart of the School. 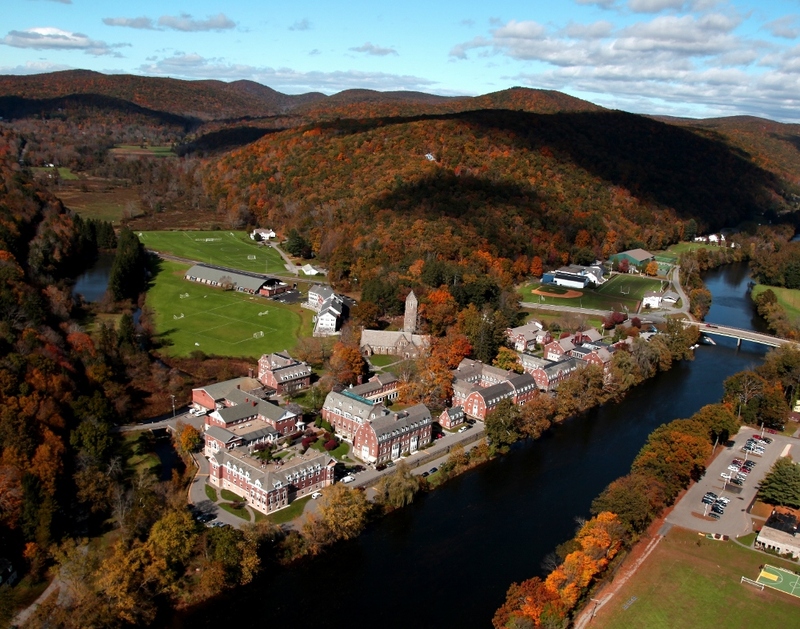 These buildings, which house our classrooms, library, dining hall, theater, music center, art studios and dormitories, are nestled between Mount Algo and the Housatonic River. The chapel stands regally in the center of the campus, its bell tower visible from every angle. It is a most inviting setting to study and learn. The campus extends well beyond the academic core, across the street to Kent’s state-of-the-art fitness center, and the gym which houses two basketball courts, a swimming pool and squash courts. Outdoors, there are two turf fields- and five grass fields. Ten miles of cross-country and riding trails wind through the countryside. Kent’s historic boathouse sits at the edge of the river. Kent Stables are just a few miles up the road. A hockey rink, baseball diamond, ten tennis courts, and softball fields round out the athletic facilities. The Town of Kent is considered an extension of the School’s campus. A short walk away, in the town’s center, you will find Kent School’s Center for Pre-Engineering and Applied Sciences, a magnificent former corporate headquarters which houses Kent’s pre-engineering program, robotics lab, as well as Kent’s dance studio. Kent students and faculty love the living so close to such a charming and quaint New England town and greatly appreciate the ability to run into town for a study break and to enjoy a freshly baked cookie, warm cup of hot chocolate, or a hot slice of pizza. Not only is Kent School situated in a most stunning location, the community of faculty, students and staff reflect the beauty and warmth of the place. Time and again, our visitors comment on the warmth and friendliness of the community here. There is energy present here which speaks to the welcoming nature of this place. There is nothing better than experiencing the beauty and friendliness of Kent School than visiting yourself. You are warmly invited to come and visit. We welcome the opportunity to meet you and share our affection for our school in person.